As if March Madness wasn't already enabling office inefficiency, now comes word of the CokeZeroSocialArena. 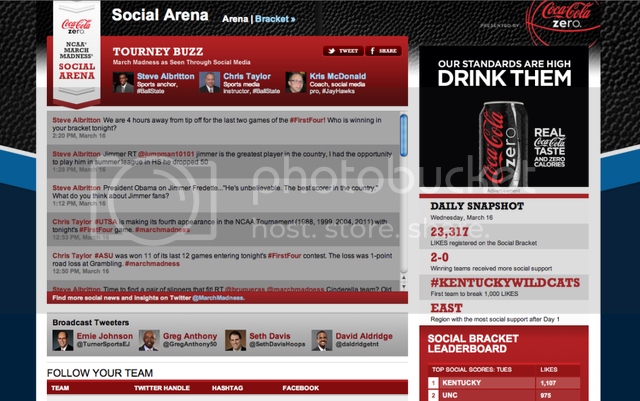 Coca-Cola Zero, Turner Sports and CBS Sports have partnered to create the "social arena," where fans can log on to CokeZeroSocialArena.com and follow basketball games and teams by the amount of social media buzz they're every receiving. In addition, the will stream games on March Madness on Demand (MMOD) and feature a real-time Social Ticker displaying fan chatter and trending topics around the tournament. If that weren't enough, the Social Arena will run a Social Bracket that ranks teams based on the sum of online conversation about each team. Joining in on the conversation will be CBS Sports and Turner Sports online and on-air basketball analysts who will be regularly commenting on live games and sharing their on-site observations with fans in the Social Arena. As the tourney winds down, the April 2nd national broadcast show, “Impressive Moments of March Madness” on CBS Sports will feature the video that fans vote on as their favorite impressive plays from the tournament.